Fig. 78 Standard cost. Table showing the standard cost of an upholstered chair. an estimated product cost, prepared in advance of production, that shows what a product ought to cost given reasonably efficient working. Standard cost includes the direct materials cost of the product, direct labour cost and production overheads, as well as distribution, selling and administration overheads. Overheads are charged to products using an appropriate COST RATE derived by dividing budgeted overheads by budgeted output. Fig. 78 shows a simplified standard cost for a product. Such predetermined standard costs are used to provide a basis for price fixing and for cost control through VARIANCE ANALYSIS. 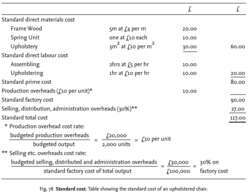 See also DIRECT-LABOUR COST VARIANCE, DIRECT-MATERIALS COST VARIANCE, OVERHEAD-COST VARIANCE. 99 for line activation and set-up which is etisalat's standard cost for a new connection. Singson said the standard cost of a two-lane road was from P25 million to P30 million per kilometer but in Palawan, the cost went as high as P40 million per kilometer. 6) They also say that, ideally, in stage two of lean transformation, companies must move away from traditional standard cost accounting and variance analysis. the first edition of the code introduced industry standard cost classification. To my astonishment, the cost of the repair was pounds 99 - apparently the standard cost for one hour or less of work, regardless of the fact it took just 10 minutes. It was agreed to consider an issue for canceling services tax to reduce costs and to activate the role of municipality guards for controlling prices and to use the standard cost form of GPC for economy, trade and investment. The service costs $30 ([pounds sterling]15) an hour with a three-hour minimum - in addition to the standard cost of renting a car - and customers will be billed separately for the chauffeur services by WeDriveU. And, finally, the Council validated the EU Standard Cost Model proposed by the Commission to establish a priority action programme. And, finally, the Council will validate the EU Standard Cost Model proposed by the Commission to establish a priority action programme. McLaren said: "It no longer became profitable for me to run the cars because licensing and bringing them up to standard cost up to pounds 4000 per year per car. Thus, any other "facts and circumstances" method, such as specific identification, burden rate, standard cost or "other reasonable allocation methods," must allocate costs to specific inventory items; see Regs.